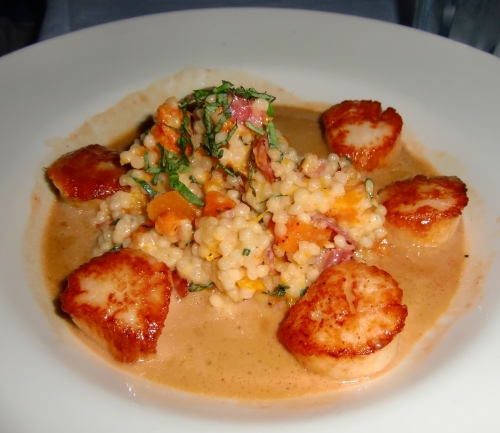 The food in Freeport, Maine seemed to come in two forms: super casual and affordable or extremely upscale and spendy. There weren’t too many options in between. Keeping that in mind, and your budget in check, you might want to save money with some cheap eats during the day so you can splurge on fancier meals in the evening. Or do as my longtime friend, Erin, and I did and split some of your meals. Of course, save room for some fun drinkies and sweet treats too! One drizzling afternoon we stopped into the Freeport Chowder House, which was filled with the most sublime buttery seafood aroma. 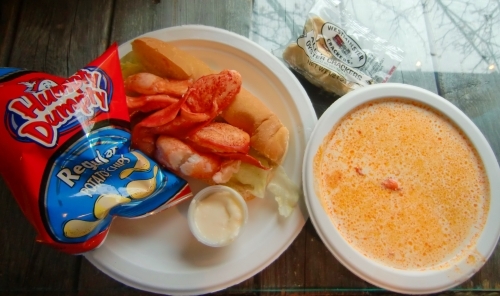 It felt like a good place to duck out of the rain to warm up over a hot bowl of chowder and a lobster roll. Neither of us had ever eaten a lobster roll before, but from their prevalence on menus displayed throughout town, it seemed the thing to do. Another patron, obviously a tourist, asked the man behind the counter, “What’s a lobster roll? The shopkeeper replied with a heavy Maine accent, “It’s lobstah. On a roll.” Indeed it was. It consisted of large, succulent pieces of lobster on a white roll with lettuce and mayonnaise. I found it a little bland but if you love big chunks of fresh lobster, you’ll probably love this. Erin and I also split a bowl of lobster stew. While it smelled wonderful, it didn’t have much flavor to it. We seemed to be the only ones who minded because the other customers were slurping that stuff up like crazy. If you are looking for a fun place for families, head to Friendly’s. The menu of hamburgers, sandwiches, and chicken strips at this informal, sit-down chain restaurant is sure to be a hit with the kiddos. Their extensive ice cream menu is a real crowd-pleaser. I have oh-so-fond memories of their candy bar-themed sundaes from visits to the East Coast as a teen. 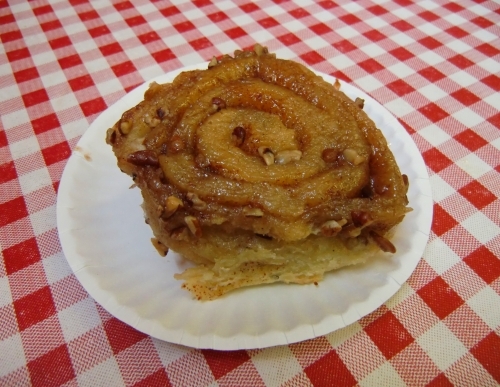 For breakfast, be sure to grab a namesake-worthy sticky bun at Isabella’s Sticky Bun Café. Be prepared to wait for a table at this counter service restaurant. You can get other affordable breakfast items here too like omelets, other baked goods, and breakfast sandwiches plus gourmet coffee drinks. For the most upscale and coveted dinner in town, be sure to make reservations at the Harraseeket Inn’s Main Dining Room. Our friend the local cabbie, Dan of AB Cab Company, promises you won’t be disappointed. We tried to snag a table but the hostess seemed none too pleased at our apparently ridiculous request for a table sans reservations. Plan ahead, people! When we could find no room at the Inn, we took a cab to The Muddy Rudder in neighboring Yarmouth. The ambiance was elegant, if a bit dated. The Deep Dish Lobster Pie was a hearty, creamy dish perfect for a chilly night. The live piano music was a nice touch. But really, the reason to come here is for a slice of their High Peanut Butter Pie. I’m not a fan of splitting dessert – this Travel Mama wants the whole thing to herself! This rich indulgence is worth sharing with its milk chocolate and peanut butter mousse, dotted with chocolate chips atop a chocolate cookie crust. There’s only one word that accurately describes this dessert: YUM! I was invited on this trip by the Hilton Garden Inn Freeport and was treated to dinner one night at Azure Café along with other journalists and their guests. I ordered the Steak Turtufo; filet mignon topped with applewood smoked marine salt served with local oyster and crimini mushrooms with black truffles and gorgonzola mousse. It was tender, juicy, and full of earthy flavor. 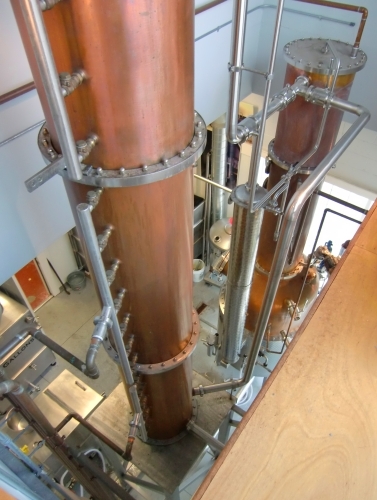 While in Freeport, stop by Maine Distilleries, makers of Cold River Vodka. While most vodka nowadays is made from grain, this vodka is made in the traditional fashion using potatoes. We had wee samples of their classic vodka, blueberry vodka, and traditional gin. Did you know that gin is actually vodka that has been flavored with aromatics? (I didn’t!) Cold River uses seven natural flavorings in its gin: coriander, lemon, angelica root, juniper, orris root, orange, and cardamom. I don’t usually care for gin because it tends to taste too much like a liquid Christmas tree to me. I wouldn’t say this gin has converted me, but it was definitely more palatable and less heavy on the juniper than other versions I’ve tried. We took a tour of the small distillery and learned about how the vodka is cooked, fermented, blended and bottled. We learned that vodka made from potatoes is much more time-consuming to produce and creates a product with a smooth, yet distinct flavor. The blueberry vodka was so good, I was tempted to bring a bottle home with me but the FAA’s liquid limits got in the way. Free 30 minute tours are available on a first-come, first-served basis and take place typically from 12:30 to 4:30 pm on Saturdays. Always looking for local flavors to try, before dinner at Azure Café, I ordered the Bubbly & Blue cocktail (wild Maine blueberry juice with Prosecco) while Erin got a Wild Maine Martini (Freeport’s Cold River potato vodka with lemon juice, Grand Marnier, and blueberry juice). I don’t know how authentically “local” these drinks were, but they were both delicious! Wicked Whoopies has a little shop in downtown Freeport that offers whoopie pies in over a dozen flavors. They were once featured on Oprah’s “O” List. If you are a regular Travel Mamas reader, you might know I am a huge Oprah fan. If the Queen of Daytime said they’re good, I had to check them out! If you are looking for a baked goodie while in Freeport, I advise stopping by When Pigs Fly, a bakery that specializes in artisanal breads. It is located diagonally across the street from Wicked Whoopies. Choose from options like “Carrot Cake” Bread, Chocolate, and Chipotle Black Bean. Scrumptious samples are available for noshing along with accompaniments like pumpkin butter. If candy is your go-to indulgence, you must stop into Wilbur’s of Maine. This was one of the most adorable candy shops I have ever visited, and I have been to a lot of candy shops. 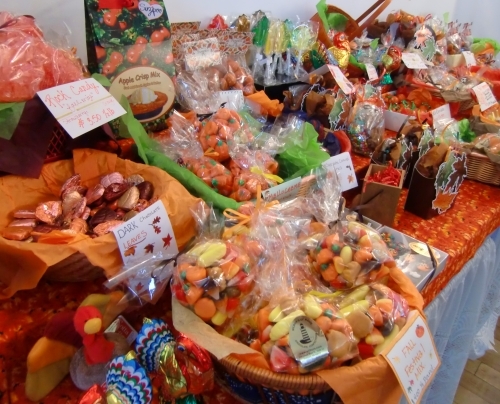 There were hand-tied packages of foil-wrapped chocolates, gummy candies, and lollipops aplenty. Be sure to pick up some absolutely addicting chocolate covered cranberries as a sweet souvenir of your travels! Would you love to escape for a weekend stay at a Hilton Garden Inn like Erin and I did? You can! Enter to win a two-night stay plus breakfast for a family of four at any Hilton Garden Inn in the world. Enter once per day through November 7, 2010. I wholeheartedly concur with your recommendations of Wicked Whoopies and When Pigs Fly! The whoopie pies are so huge, so we tried the miniature versions. Unfortunately, they only come in the original flavor, so my peanut butter-loving husband didn’t get to try their chocolate / peanut butter combination! Oh, and I almost ate an entire loaf of olive bread by myself. When I got too full of the bread, I just picked out the olives. I’m not proud. Traci – I love, love, love olive bread! I missed that one this time around. Next time…! I later found out that lob-stah rolls are supposed to have drawn butter on them…doesn’t that sound delicious? Much better than mayo and lettuce (although I admit I don’t like mayo). Those scallops were to die for!! (1) now I’ve got sticky bun on the brain, and (2) where’s my sample of all these delectable items while staying home with kiddos? !